After the Giulietta analysis, is time for the MiTo. Last year the brand sold around 28.000 units of this car, down 32% circa. That’s a very poor result considering its segment and the good results of its main competitors, the Mini, Citroën DS3, and Audi A1. Things get even worse when it is taken into account the fact that the MiTo is the second and last best-selling model of the brand. Hence, its sales counted for 28% of the brand’s total sales, and its big fall contributed to terrible results for the Biscione brand. 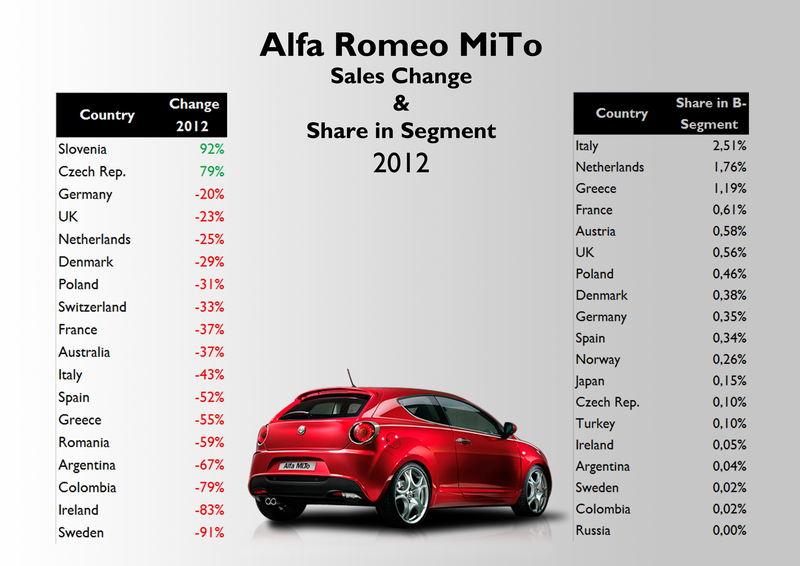 Italy counts for 38% of its sales, but it was one of the markets where the MiTo had a big fall, down 43%. From 18 markets evaluated, sales fell in 16. 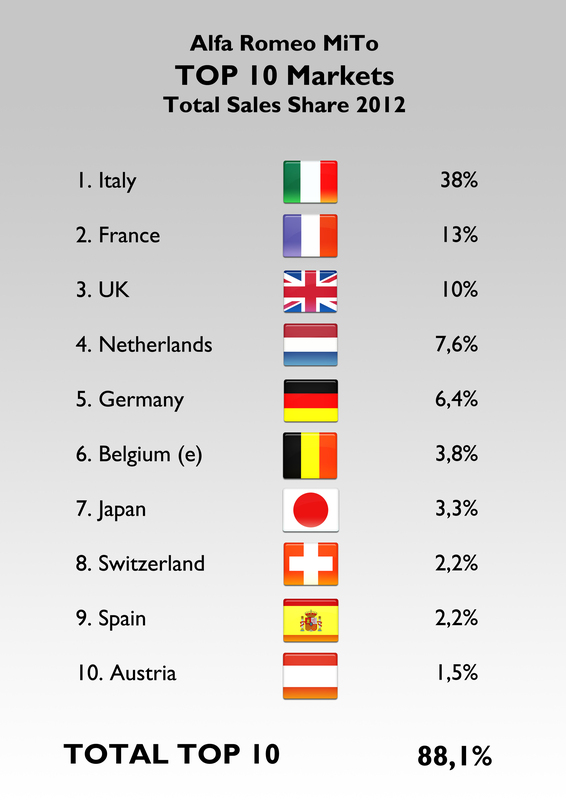 France is the second largest market, with 13% of the total. Then comes the UK, Netherlands, and Germany, where the sales fall wasn’t that big. 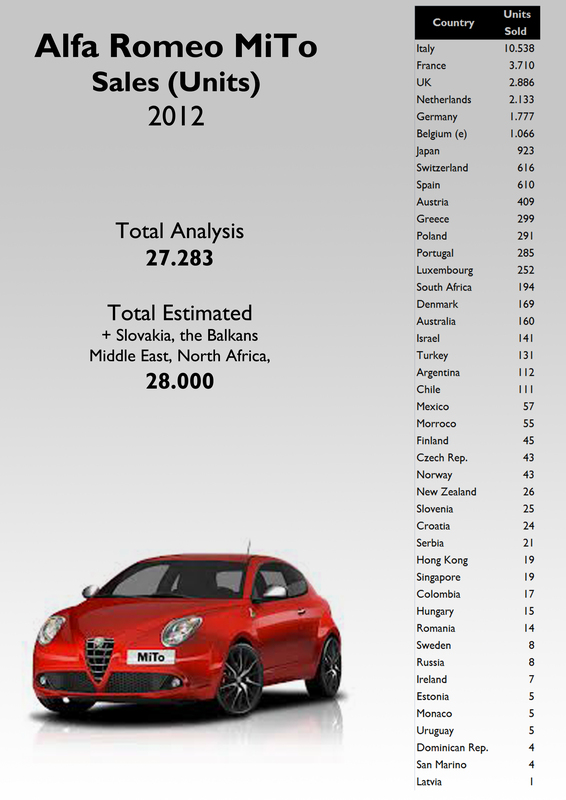 In fact, the Netherlands is one of the few markets where the MiTo outsells the Giulietta. Japan occupies place #7, with almost 1.000 units sold. What’s next for this model? last week, Alfa Romeo presented the MY 2013 version, but no deep changes were introduced. Unfortunately, after 5 years in the market, the brand will wait even more for a complete restyling or its successor. Unless it has an aggressive advertising campaign, the MiTo will continue to fall in the rankings. The lack of a 5 door version, and its bad positioning (Alfa offers it as a premium but at the same time there are 85 cv or LPG engines available), haven’t helped to its success. Besides, the competition is very tough and this year it will get even worse with the arrival of the new generation Mini (that will be offered in 5 door version as well). 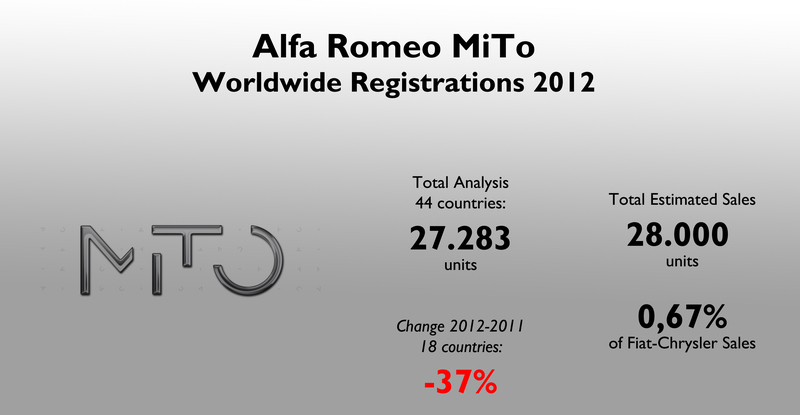 Alfa Romeo might sell around 18.000 units of the MiTo in 2013. Too bad. ← Alfa Romeo MiTo or Citroën DS3? These numbers are disgraceful. VW Polo had 825000 sales in 2011. And that car is around the same price. Obviously, something is very wrong with quality of this car. Or people just do not like its looks, witch is very possible. Sad story, this little car promised a lot. Alfa should make its way from bigger cars and than B segment Alfa Romeos would be more respected. Audi copied Alfa Romeo strategy. First introducing a C segment car, the 147, in 2000. Audi followed in 2003 with the A3. Secondly introducing a B segment car, the Mito, in 2008. Audi followed in 2010 with the A1. Yes, but when Audi launched the A1 and A3 it had already well positioned its upper segment cars. Alfa did the opposite: it launched the smaller ones when it was distroying the big ones. That’s true Juan Felipe, they have to come from the Top down. Audi may have followed them down earlier but now AR is starting with a clean new sheet of paper. The important is Alfa launch new models and these must be good as Audi. To launch new models that are as good as Audi, that’s hardly the problem, it is to launch new models that are perceived to be as good as (or better than) Audi that’s the problem. And that’s a matter of marketing, really. But hopefully Alfa Romeo has bigger ambitions than to beat Audi, though – how about beating BMW?